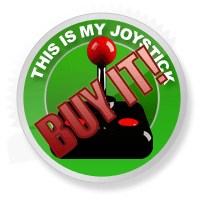 Review: Snoopy Flying Ace Review - This Is My Joystick! When I nominated myself to review Snoopy Flying Ace, I have to admit it was more out of curiosity than a definite want or need to play this game. I had seen several gameplay videos from around the net and it reminded me very much of the original Xbox and PC title, Crimson Skies. So with that in mind I stuck my hand up, and here I am with my review. Actually my instincts were right, this game is very much like Crimson Skies, although not in terms artistic or graphical design, but in the way the game is set up and how the controls handle. Firstly, before we get to all of that. I really feel we need to take a look into the fiction of Snoopy, and why exactly he and his friends appear in this flight shooter. My memories of the little beagle date back to my teens, where you’d often find Snoopy sitting on his kennel in a Charlie Brown TV Special. But Ol’ Snoop Dog dates back before that, in fact way back to the 50′s, where he was part of the Peanuts comic strip that appeared in syndicated newspapers across many a state in the U.S. The comic ran from 1950 till 2000 when sadly Snoopy’s legendary inker Charles M. Schulz passed away. Snoopy and the gang do still exist today in motion comic form, but with a new artistic style many feel the Peanuts gang’s glory days are well behind them. Still, to place these characters in this genre of game may come across as a bit odd? They weren’t exactly World War One fighter pilots in either the comic strip or cartoons. No, in fact the only reference is with Snoopy himself, who’d often day dream about dogfights with the infamous Red Baron. Is that enough to warrant putting Charlie Brown and co in a flight shooter? Well the fact they are Snoopy’s pals would seem to suggest yes. Snoopy himself does actually have deeper roots in the aviation world and the U.S space programme. He’s had the Apollo 10 lunar module named after him, there is a special NASA honour award in his name, as well as being the mascot for both NASA’s aerospace safety programme and the U.S Air Force communications computer controls system. He was also the most decorated plane art for planes in the Gulf war, and he even has a plane named after him, the B-58 hustler Bomber. There was even a 1966 chart topper by the Royal Guardsmen called “Snoopy Vs. The Red Baron”. So, all that evidence would probably be enough to explain why developer Smart Bomb Interactive decided to make this Xbox Live Arcade game a flight shooter. Well, there is actually more, seeing as this isn’t the first Snoopy flight game That Smart Bomb has produced. Way back in early 80′s, Snoopy and The Red Baron was an Atari 2600 and 2800 title. It was a somewhat basic side-scrolling shooter, with snoopy atop of his kennel engaging in furious battles with game titular nemesis, the Red Baron. Then, back in 2006 Smart Bomb actually made a version of Snoopy Vs. The Red Baron for the PS2, Xbox, PC and PSP. While looking at that game, you could well think Snoopy Flying Ace was a direct port with a flash high-def sheen added to it, and on some levels you could even be right. Anyway, with all that established, you can now hopefully make the connection between Snoopy and World War One dogfights. To the game then. Snoopy Flying Ace is an 800 M$ point Xbox Live Arcade title that is firmly set as a multiplayer flight shooter. The game does with come with a campaign mode, but with the loosest of story lines attached it is obvious that this was set up simply for the controls tutorial and a place to hone your flying skills for the multi-player action. 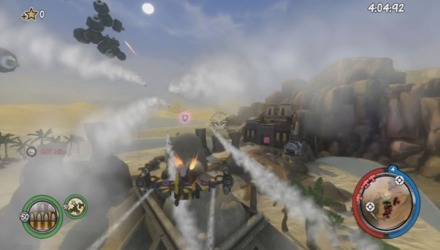 The controls are very simple, again very much in the mould of Crimsons Skies, and you are given the option to invert your controls if you wish to play that way. The planes handle very well with your left stick to guide you, whilst the right stick acts to give you barrel rolls and looping skills. The trigger buttons act for firing your weapons and the B button switching your secondary weapons as and when you wish. It’s very simple to pick up and get straight into the action, which is a huge benefit to the game. In the campaign you play as Snoopy himself as he battles through eighteen stages, each with a certain scenario task to complete. Also each stage comes with a couple of mission criteria to meet, such as complete the level in under a certain time, or don’t die during the stage etc. Meeting these mission criteria will earn you medals of either the silver or gold variety, depending on what difficulty you choose to play at the start. Sadly, here is where one of the first issues pops up with the campaign mode. You can select from two difficulties, either cadet or veteran. Cadet I figure is your normal level of play, and veteran obviously being a harder and more testing difficulty. However even at cadet level, some of the stages silver medal criteria are so brutally hard, that this reviewer can only quake with fear at how hard the gold medal criteria must be. It becomes increasingly frustrating when you only have a set amount of time to complete the stage if you want the medal, and you can only watch helplessly as the time at the top of your screen ticks passed the required time with you nowhere near finishing. Why are these medal criteria set so difficult? As for the stages themselves, each is different, where as one stage will be a timed race where you need to get through all the rings in under the time, another will have you fighting off waves of other planes as you are given a building, statue or monument to defend. Each stage is different and offers a new challenge each time, however the fight isn’t always in the air. Like I said previously, this game is also very similar to that of Crimson Skies. This becomes very obvious when you are given the task of flying into a building or turret, where you are then flung into the view of a cannon’s cross-hair, as you are required to take out planes as they fly by your sights, with you in your grounded position. Here raises my second issue with the game. When you are in your plane you are given the standard machine gun in the form of your right trigger button, and your left trigger is for your secondary weapon, of which you get a choice of two load outs. You can have a mixed choice of any of the available weapons, ranging from a shot guns, plasma grenades, ranged missiles, EMP bombs etc. It’s the usual choices that comes with these style of games, but it is nice that you can switch between the choice of two, and really helps when trying to defeat certain types of planes and bosses. Where it falls down though, is your machine gun does barely any damage, and trying to hit with your second weapon is no easy thing. Each weapon comes with a varied degree of ammo amount, damage and range effectiveness, and finally homing. Homing is the one you want to focus on though, as there is no lock on in the aiming of this game, being a world war one setting you can probably understand why; lock on capability didn’t exactly exist back then. Seeing as swipe of the right analogue stick either barrel rolls left or right, and flick down does a loop, it quickly becomes clear that you’re going to find it quite hard to take down the enemy planes with a few shots. However if you’re on the ground in a turret, aiming and take down capability is much easier, as it takes either two well placed shots, or one accurate shot to take down the planes high above. So, it poses the question: why bother getting into dogfights, when getting to the turret makes the game that much easier? I have found when in a plane the EMP is by far the most effective weapon to use, but you have to be in close proximity to the plane you’re trying to take out, and the EMP does need charging. To me, it just seems strange that in a game so focused on air combat, that one tactic is far more beneficial than another, especially as the better option seems to be from the ground. Graphically the game is solid and runs at a nice rate. The designs are a little basic and very reminiscent of a Ratchet and Clank or Spyro title, but with the HD polish it is a quaint and satisfying experience. The important part is that it looks like how you would expect from a snoopy title. As for the stages themselves, they are nicely designed and suit the fiction well. As you’d expect there are a lot of things to avoid when getting down low, things like mountain sides, warships, and a wide variety of other obstacles are all there for you to dodge whilst trying to concentrate on your enemy. The stages also have a nice range of place settings over both land and sea, be it over the sands of an Egyptian styled area, or an icy cold North Pole island. The maps aren’t overly huge in size, but they are more than adequate for the set stage. War is a terrible thing, so to provide Snoopy Flying Ace with a thumbing bass line, or high adrenalin tracks would be a foolish move. Luckily the producers have kept with a low tempo, doom looming score that fits well with the World War One era. Being an XBLA game, and only a short campaign, there isn’t exactly a huge amount of music stuffed into the game. What you do get is three or four low beating drum tracks which are obviously influenced by a military band of the day. It isn’t exactly thrilling stuff that gets your heart thudding with excitement, but it does sit very well for that 1900′s wartime vibe. Vocally the characters are mute, with only Snoopy and Woodstock getting any kind of audio treatment for the campaign mode. As for the sounds of the planes, well their engines hum beautifully when cruising, strain with the pressure of high long downward dives, and splutter and stall when you hit opposing plane or if you smash into a piece of the environment. While the machine gun is tad tinny, your EMP’s pulses with delightful electricity as you charge it up and crackle as you unleash it. In fact each of the array of weapons have a solid and authentic sound that help you buy into the action. As well as the solo campaign you also get a local co-op option in which you can battle through the stages with a friend, and also a local multiplayer option for those who want to keep your battles one on one. These are nice options to have, and always handy if you have younger ones too impatient to wait for a sibling to finish their go. However, I’m not sure this game would be all that suited to kids, especially with some of the difficulty on certain stages of the campaign. Where this game really shines though is in its online multiplayer mode. With nine different solo and team types games for lobby’s of up to sixteen to play through. It’s easy to jump on and find yourself in the thick of the action quickly. The game types are those of the usual death matches for solo and team play, capture the flag (bone in Snoopy’s case) again for solo or as a team. There is a game called Dog Pile, where to win you need to hold onto the bone for the longest throughout the duration of the round, again this is for both solo and team formats. Finally is a mode called Pigskin, which is basically American Football in the sky, where you score points by flying between the uprights whilst in possession of the ball. Watch it though, as the opposition will be gunning for you and trying to steal the “Pigskin”. Each of the mode on offer provide a fast and furious game, where you’ll find yourself caught up in the heat of the battle at every moment of the round. Oh, and a more surprising note, you’ll find that Snoopy Flying Ace also comes with kill streaks. Yes, if you rack up four kills you’ll find Snoopy’s best mate Woodstock flying behind you throwing bombs at following enemies, and if you’re skilful enough and notch up nine consecutive kills, you get to fly about on Snoopy’s very own kennel, making yourself a much smaller target to hit. It works and it is a nice touch. Online you have the whole peanuts gang to choose from, whether it be Pepper Mint Patty, Charlie Brown and Linus, right down to some of the lesser known friends like Franklin (yeah I he no idea who he is either). Don’t worry though, if none of those guys take your fancy, you can choose your avatar to use when playing the co-op or multi-player modes. Although a small arcade title, this game does actually have a lot to offer. Those who loved the Crimson Skies experience would like this, the multiplayer really does drag up some nostalgia of those good old days from back on the old Xbox. The simple controls and easy handling makes combat undaunting when getting into a dogfight with anybody, even if they are several ranks higher than yourself. The graphics may not be cutting edge and the campaign leaves a little to be desired, but is that really what this game is about? Simply put; it isn’t. This is a solid game which offers buckets of fun and game time if you want that multiplayer experience. As for Snoopy and his friends… I don’t feel they offer all that much to the experience, sometimes you can forget it even involves them. Yet, his name on the title, so Snoopy proves there is life in the old dog yet.